The New York Daily News currently has an article about one of the newest Grace Brethren churches, pastored by Michel Faulkner, in Harlem. Here is an excerpt–to read the entire article click here. Spiritual leader: The Rev. Michel Faulkner, former New York Jet and president of The Institute For Leadership. Years in present location: One year. “ We started at the Harlem Lanes in June 2006,” Faulkner said. Size and character of congregation: “We have approximately 70 regular attendees. Multiethnic: 50% African-American and 50% Latino. We have a large number of young families. 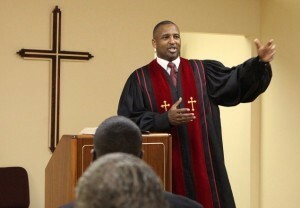 Approximately 50% of our congregation are men,” Faulkner said. Wednesday: Bible study at 7 p.m. and Men’s Prayer Walk from 6 a.m. to 7 a.m.; Friday: Youth service at 7 p.m.
That is truly exciting news. We pray that the New Horizon Church of New York will have God's blessing as it demonstrates and proclaims the love of Christ to the people of Harlem and the world.